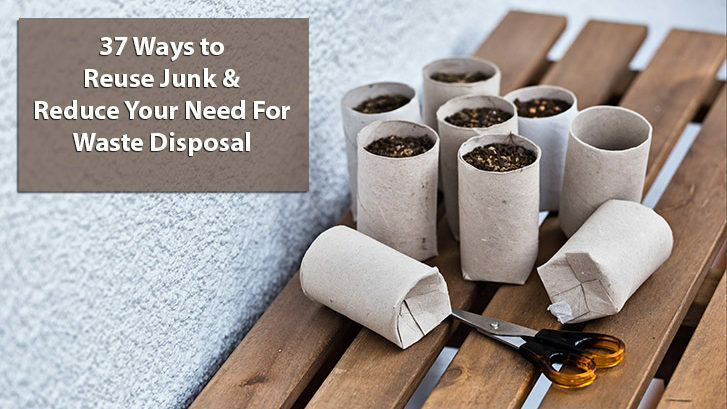 Here are some clever ideas you can start using today to help reduce the amount of garbage you produce. 1. Blackboard Chalk: Put leftover pieces of chalk in a container with your sterling silver to prevent tarnishing, then share this tip with everyone you know to get instant cool kid points. 2. CD Spindle Cases: The spindle and the circular shape of these are perfect for storing your gazillion coiled up cords. 3. Cereal Boxes: Using the biggest sides, cut a hole in each. Cover them with wrapping paper or fabric and use them as mattes for photo frames. 4. Metal Bottle Caps: These can be used to mend dents in wooden tables. Use a needle or pin to poke holes in the dent, spray a little water onto the area and place a wet rag on top. Put the bottle cap, smooth side down, over the rag where the dent is and use an iron to apply heat to the bottle cap. The moisture and heat should relax the crushed fibers and bring them back up again. 5. Sardine Can Keys: Other than needing one for that time when you end up with a can that’s missing one, these are also useful for saving toothpaste. Roll your toothpaste tube around the key from the bottom up to make sure you get every last bit of toothpaste out. 6. Plastic Condiment Bottles: Ketchup and mayo bottles work great as pancake mix dispensers. Refill one with your pancake mix and use it to squirt the correct amount of mix into your pan. 7. Tissue Boxes: These can be reused to store and dispense plastic shopping bags, saving you the sometimes extravagant cost of the commercially available dispensers. 8. Banana Peels: Bananas contain potassium, which is the key ingredient in shoe polish. Rub the inside of a banana peel all over your shoes and then buff to a shine when you’re in a pinch. 9. Old Books: Glue and screw one side of an “L” shaped wall bracket inside an old book. Mount the other side of the L bracket onto the wall to make an invisible floating bookshelf. 10. Lint: The lint you’ve collected from your dryer’s air filter can be used as mulch for your plants. Restrict it’s use to your outdoor plants only though, as it’s highly flammable and can be dangerous if used indoors. 11. Nail Polish: Coat screws and bolts with nail polish and tighten. Once the polish dries it will prevent the screws from loosening. Homemade Loctite! 13. Styrofoam Packaging: Save clean takeout containers and Styrofoam packing materials to use as your own packing filler when shipping. Better than ending up dumped in a landfill by a waste disposal truck. 14. Shower Curtain Rings: Hang your purse or bag on one and hook it onto your closet rod for organized storage. 15. Frisbees: Granted, you probably don’t have many of these, but they make great paper plate holders at a barbecue. 16. Beer Bottle 6 Pack Holders: The handles and slots on these are perfect for holding condiments at parties. 17. Rubber Jar Sealing Rings: Glue these big washer-type pieces of rubber on to the bottom of your glass / ceramic vases and lamps to prevent them from scratching your tables. 18. Socks: Old socks that are still in decent condition can be cut off at the foot to be used as shoe bags for travelling to keep the clothes in your luggage clean. 19. Toothbrushes: Clean, old toothbrushes are the perfect cleaning tool for everything! From jewelry to silverware and everything in between, these are invaluable as cleaning tools. You can even use them to clean the threads off freshly shucked corn. 20. Roller Shades: Paint one side with blackboard paint and you have a blackboard for your kids that can be conveniently hidden from view. 22. Laundry Detergent Bottles: Punch holes in the lid of one and use it as a watering can for your plants or to wash your toddler’s hair in the bathtub (make sure you clean it thoroughly). 23. Pill Bottles: Glue the lid of one to a rock, put your house key in the bottle and bury the bottle in your garden with only the rock showing. Perfect hide-a-key in case you’re ever locked out! 24. Wood Pallets: Paint one, stand it up on its side use it to store hockey sticks, baseball bats and other long handled items that store better standing. Better than leaving it on the curb for waste disposal and buying an expensive stand that does the same thing! 25. Pool Noodles: Cut one up into 2 inch slices, each with a small notch in it. Squeeze one onto all the doors in your house to prevent your kids from closing them onto their fingers. 26. Plastic Bags: Fill one with frosting and cut off a corner to make a pastry bag. 27. CDs: Use one as a paint palette next time you’re feeling your inner Picasso. The hole in the centre is perfect for your finger! 28. Shower Curtains: Cut one into sections and then cut a hole in the middle of each section. What do you have? Waterproof smocks for your kids’ next painting adventure. Or a gown to keep the hair off them next time you’re cutting their hair, unless you’re lucky enough to own a Flowbee! 29. Empty Toilet Paper Tubes: Another household item that’s infinitely reusable. Try wrapping your hair ties around one in the washroom so they’re not eaten by your cat. Or slip one over a coiled extension cord to keep it from unravelling and free of tangles. 30. Empty Paper Towel Tubes: Slide one over your leftover wrapping paper and save yourself the tape. 31. Cassette Tape Cases: If you know what these are, you probably have some lying around beside your Saturday Night Fever album. Save these from ending up in your city’s waste disposal trucks and use them to store your headphones to keep them tangle-free. 32. Shower Caps: Another great item that you can wrap your shoes in when travelling. 33. Contact Lens Cases: Have you gotten Lasik? Even if you haven’t you probably still have old contact lens cases you can reuse for pill storage in your bag. 34. Rubber Bands: Use a combination of a few or different colours as drink markers at your next party. They have the added bonus of giving you more grip when your motor control starts to get a little sketchy. 35. Corks: Other than the more common use of using them as pin cushions, you can cut them into small slices and use them as door bumpers for your cupboards and drawers. 36. Plastic Orange Juice Jugs: Cut the bottom and one side off of an empty juice jug to use as a perfect scoop for your potting soil or ice salt. 37. Anti-Bacterial Wipes Containers: Reuse an empty one by storing your yarn in it. The container also dispenses it perfectly and keeps it tangle free. 38. Baby Wipes Containers: Like the wipes container above, these are also great for holding and dispensing your yarn. And in case you’re wondering: no, we don’t particularly like knitting. But we are a big fan of Stallone in Demolition Man. Do you have any cool ideas on how to reduce your need for waste disposal? Let us know in the comments and remember to follow City Waste Services on Facebook for more tips and tricks on reducing your waste!